Trees are perhaps one of the most distinguishing features of the Bryker Woods neighborhood. Visitors frequently comment on the lush canopies overhanging our streets. See map. The shade provided during the summer gives the neighborhood welcomed relief from the hot sun. Trees also provide a inner city haven for wildlife, especially birds. Screech owls can frequently be heard and even seen at dusk or early dawn while walking in the Bryker Woods neighborhood. The City of Austin has created a listing of the city’s largest and oldest trees and the Bryker Woods neighborhood has several of theses designated City of Austin Heritage Trees. Live Oak Tree at 2815 Wooldridge (besides house) – 10th largest tree in Austin! So why all the attention to neighborhood trees? Energy Conservation – Properly placed shade trees can reduce home energy consumption up to to 30%, by providing shade for roofs and walls. Air Pollution Reduction – Trees help clean the air by removing poisonous gases and particulates such as dust and pollen. Through photosynthesis, trees reduce atmospheric levels of carbon dioxide and release vital oxygen. In addition, well-placed trees reduce the need to burn fossil fuels to generate energy for air conditioning. Water Quality and Conservation – Trees and other landscape plants help slow surface water runoff and reduce soil erosion. The soil adsorbs more rainwater; consequently, less water is needed on your landscape. With overall temperature reduced by shading, plants and turf require less water. Wildlife Habitat – Trees provide food, nesting sites and protection to a wide variety of birds and animals. Environmental Improvement – Trees contribute to community pride, instill feelings of relaxation and tranquility, and add natural character and beauty through a variety of forms, colors and textures. Personal Statement – Planting a tree can be an act of peace that says you care about our environment and our future. What better way to either honor a friend or loved one or commemorate a birth or marriage than to plant a tree. Although trees seem to be a permanent fixture of our neighborhood, trees are living organisms that need occasional attention and protection. When young, trees need to be watered regularly until the root system becomes established (especially during the first several summer months). And when older, trees need appropriate pruning so the the tree is provided optimal health. Oak wilt is an ailment that should be watched for as live oak trees mature. Learn more about oak wilt at the city’s Oakwilt website. Trees can also be threatened if trenching for irrigation systems is done in an insensitive manner! Request that the team installing your irrigation system be conscientious of tree root systems. Perhaps the greatest threat to our neighborhood trees is development. While sometimes is is necessary to remove a tree to add an additional bedroom or bath, the scraping of a lot for construction of a “McMansion” is frowned upon by all residents. 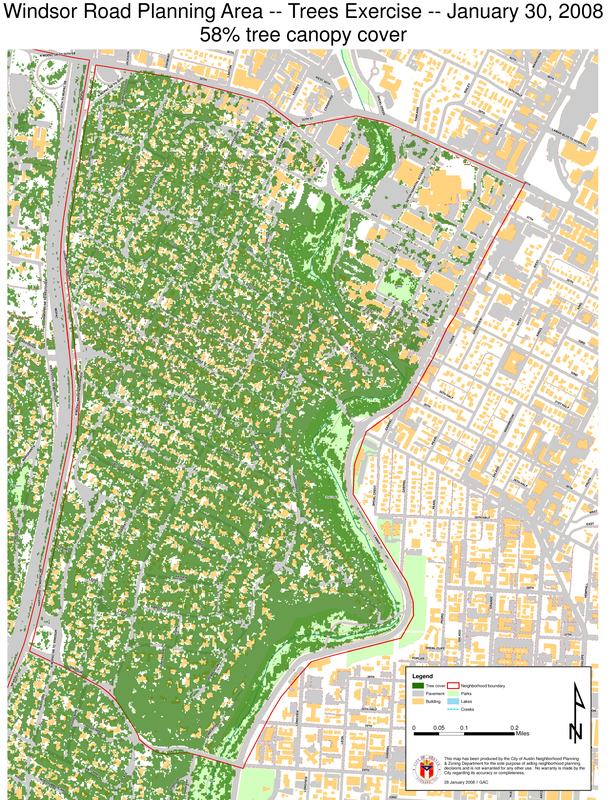 Developers are advised to note city regulations for the removal of trees!The city of Austin does require a permit for protected trees (defined as a tree with a circumference of 60 inches or more, measured at 4 1/2 feet above the natural grade). To learn more about what you can do to protect, preserve and foster trees within the Bryker Woods neighborhood, download the TreeFolks planting guide [184k PDF] and visit the websites below. Trees are a tremendous asset to our quality of life. Far to frequently are trees taken for granted. And only when they are gone, are they truly appreciated for their grandeur. The majestic cottonwoods at Deep Eddy will never be forgotten. As with any living organism, trees have a finite life span. Sometimes their removal is required for reasons of safety. However should an old tree occupy your residential lot, consider what actions you can take to maintain such a wonderful asset. And consider planting new trees too. Future generations will benefit from the trees we plant today. This way the lush canopies will continue to overhang our neighborhood streets and provide BrykerWoods shaded relief from the hot Texas summers.